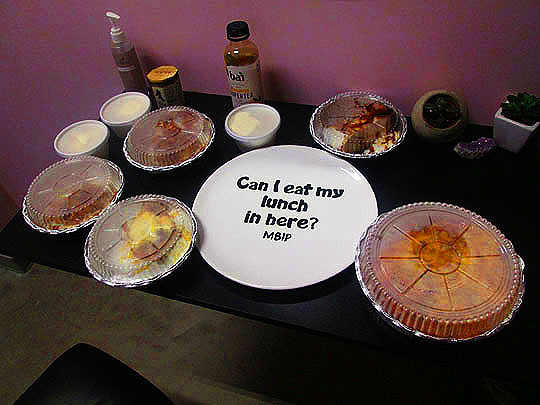 Last week I featured a plate I made for the MBIP Can I Eat My Lunch In Here? episodes. I haven’t had a successful luncheon episode since I went to the James Kelly Law Firm back over two years ago! It’s been two years of awkward moments being turned away and here’s just a few of the failed luncheon examples: Doc Halliday’s, Simantel and The Peoria Police Department. I’m ready for a successful luncheon outing and so I asked Heather, pictured below with the new official MBIP Can I Eat My Lunch In Here? plate if she had any ideas on a place that might be fun to go to. She said that right around the corner from Fired Up is a hair salon called Aura Salon where she gets her hair done and she thought they’d be happy to play along with some luncheon hijinks. I made her swear not to tell them and so today, we’re off for another awkward edition of...Can I Eat My Lunch In Here? 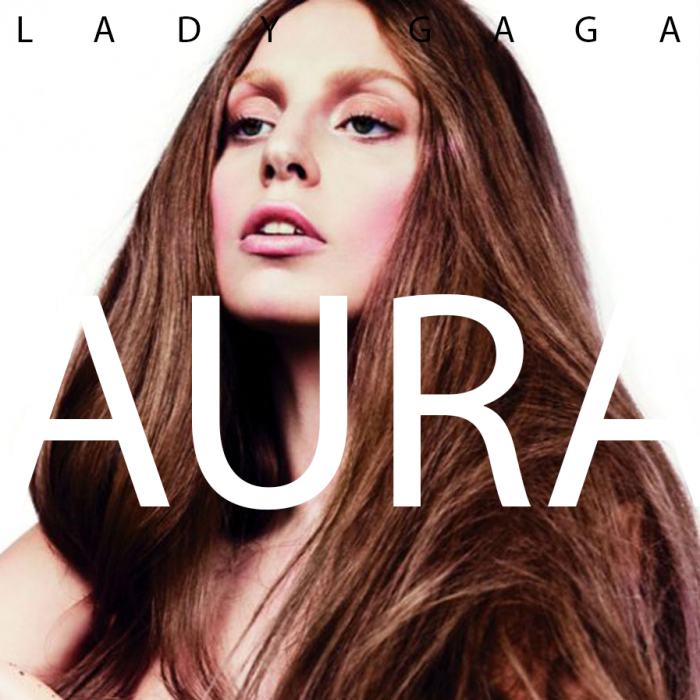 Aura Salon! Let’s get inside before the lunch turns to ice, it’s freezing out here! I have mentioned how much I hate winter, right? Oh, good. I went in and met one of the owners, Andrea. She asked how she could help me and I told her I had two questions for her: 1. Do they have a place to eat lunch in? And 2. Can I eat my lunch in there. She laughed and said of course I can eat my lunch in here and then told me she’s a fan of the blog and that we met at the Build Peoria Chili Cookoff at Tower Park back in 2017. Well, this certainly is this least awkward Can I Eat My Lunch In Here? episode ever! Let’s go and eat our lunch in here! 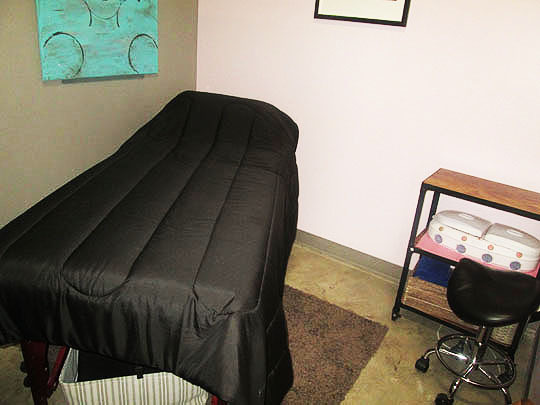 Andrea said that they do waxing in this back room, but it also has a table that folds out and the room doubles as their lunch area. There she is setting it up for me and she took a photo of me with the official MBIP Can I Eat My Lunch In Here? plate. So far we’re one for one with the new plate! Hooray! There’s the luncheon spread on the table. Let’s uncover it and start eating, I’m starvin’ like you know who! I got the BBQ Chicken Flat Bread for the main course and it’s delicious! It’s a crisp flat bread topped with chunks of grilled chicken breast, caramelized onions, a blend of cheeses and they use their house-made Guinness BBQ sauce on it. It’s crispy savory, spicy and very rich tasting. Perfect on a winter afternoon when you’re lunching unannounced in someone’s hair salon! I also got three desserts to share with everyone in the salon. I’ve never had the homemade desserts at W.E. Sullivan’s and they look unbelievable! From top we have: Cinnamon Roll Bread Pudding, Irish Cream Cheesecake and Salted Caramel Skillet Cookie. I got two orders of the Salted Caramel Skillet Cookie, because Malorie said it was her favorite. Let’s dig in! This is a trio of sweet delights! I love all of them, but Malorie was right, the skillet cookie is unbelievable! Let’s see if anyone else out there wants to try some of these decadent desserts. Andrea’s co-owners, Alyssa and Sarah happily tried out some samples and they loved them! Okay, let’s take a little tour in here and walk off the lunch and desserts a little bit. This place has a comfortable and cozy feel to it with a touch of elegance. And check out that unplanned obligatory mirror shot in the last photo, I love it when that happens! Another thing I love are Alyssa’s boots! How cool are those? 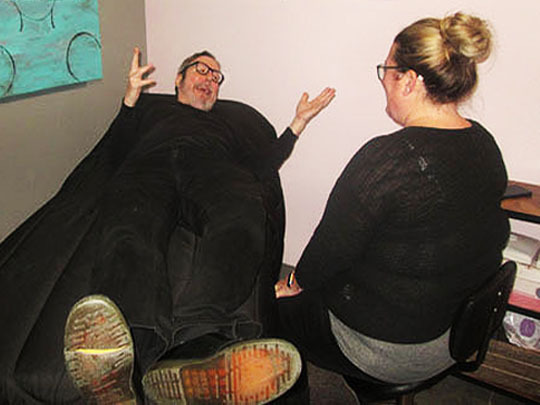 Sarah volunteered to be the impromptu therapist and after confessing my many fears, phobias and mental problems to her, I felt much better, but I think that she’s scarred for life! Aura is owned by (from left): Alyssa, Sarah and Andrea. I asked Andrea to share their story with the MBIP audience and here it is! “The three of us met in cosmetology school and over the last twelve years kept crossing paths with each other. A couple years ago we all worked together at another salon and as we spent more time together we decided to take the plunge and open our very own place. After some searching we came across this location in Peoria Heights. We began to fill in the blank space and watched it evolve. The name was the hardest part, we really wanted something that expressed our personalities. Aura is all about the energy and feeling a person or object radiates. We want everyone to enjoy being in our salon and leave feeling amazing. Sarah and Andrea travel and educate for Milk_Shake and have continued their education in Chicago, New York and Italy. Aura is proud to have seven stylists and one barber. We do all salon services, bridal services, makeup, full body waxing, lashes and hot shaves (barber services). We are all self-employed so hours vary but generally the salon is open from 8 to 8pm Tuesday to Friday and 8 to 4pm on Saturday. The three of us have a great friendship and work wonderfully together. That’s quite an inspirational story of three women building a successful business in Peoria Heights! It shows that hard work and a strong focus really does pay off! Cheers to Aura Salon and thanks for letting me eat my lunch in there! My losing streak is over! Let’s see if we can keep this trend going! Related Posts: Can I Eat My Lunch In Here @: Random and Sweet Cece’s, Running Central and Moxie’s ReSale Boutique. TAGS: Can I Eat My Lunch In Here?